Reprint. Originally published: London: Bluffer's, 2014. 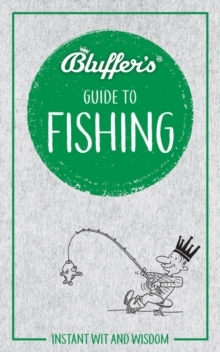 Instantly acquire all the knowledge you need to pass as an expert in the world of fishing. Know what to say, what not to say, what to do on the water, what to do in the water, and what excuses to make if you can't put a lugworm on a hook or take a 12lb rainbow off one. Never again confuse a bonefish with a kipper, a PVA bag with a popper, or a gozzer with a Hairy Mary. Bask in the admiration of your fellow fishermen as you pronounce confidently on the comparative literary merits of Izaak Walton, Ernest Hemingway, Paul Torday, and JR Hartley. Above all, know exactly how to hold your own against the sort of fishing fantasist who claims that he once wrestled a 200lb Giant Trevally into submission on a river bank in outer Mongolia. (Hint: look him in the eye and say: `Really? I thought the "GT" was more likely to be engaged in combat on a remote Tahitian atoll. ')Written by experts and offering readers the opportunity to pass off appropriated knowledge as their own, the Bluffer's Guides provide hard fact masquerading as frivolous observation in one witty, easy read.